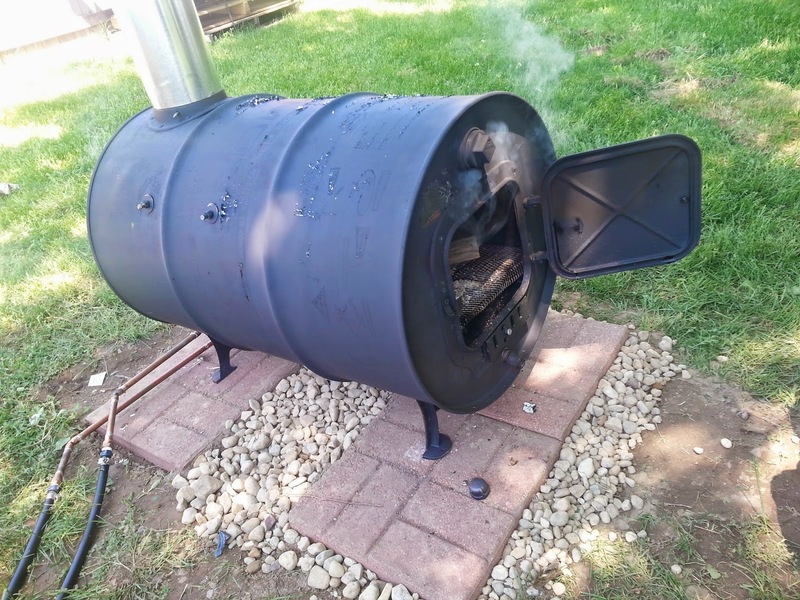 Update on the Wood Burning Pool Heater - How Well Does it Work? I have had quite a few requests to provide some more detailed information on how well the wood burner works. I would like to share some temperatures with you using a AGPtek Dual Two Channel Digital Thermometer . I have been very happy with how well this pool heater has worked for us this year. We have had such a cold summer here in Michigan this year and this heater has been one of the only reasons we have been able to enjoy the pool. Normally, the solar heater and solar cover can keep the pool comfortable but this year it has just not been adequate. I have run the wood burning heater only when needed, maybe once or twice per week at the most. We have been able to easily keep the pool temperature above 75 degrees so far this year. The numbers and methods here are just for rough estimation of how well the heater works, this is not meant for the science books, but should hold true with a heater of similar size and efficiency. I measured about 69 gallons per hour with a 33 degree average warm up to the water. This was with an average sized fire going as the temperature here will fluctuate as you add wood and let it burn through. I have seen it as high as 45 degrees and as low as 15 degrees, so it just depends on how much and what material you are burning. Calculations I used: 15,000 gallon pool divided by 69 gallons per hour (filled one gallon in 52 seconds) gave me 217 hours to heat all of the water 33 degrees. Or if you reduce, it comes down to about 27 hours for 4 degree rise for the entire pool. You can also just divide 33/217 to get a coefficient that can be used to create a formula. Y = .15x where Y is the degrees you will heat 15000 gallons of water and x is the number or hours you run the heater. So if we plug in 24 hours for x we get y=3.6 degrees Fahrenheit. Hopefully that makes sense to be used as a ROUGH estimate for calculating how much you can heat a similar sized pool. Aquarium air pumps are one of the most common types of water pumps for your fish tank. Pondmaster If there is some major issue beyond the wear & tear of diaphragm, replace the pump as it can be a very potential hazard.